Racial and religious peace should go beyond having OB markers. Tng Ying Hui. TOC will be migrating to a new server in the coming day or two. If you experience any accessibility problems, please do be patient. The new server will allow for faster access speed on this website. I love this phrase of the pledge, for all the virtues it embodies. Peace, understanding, tolerance and love. Wars and riots caused by issues of race, language and religion are replete throughout history. 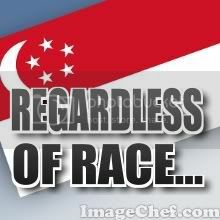 For multiracial Singapore, these are important lessons to learn from. More importantly, to achieve and maintain the peace we now enjoy would be more than an ineffable ideal; it is a process of which, despite being long and arduous, the end would be long lasting and peaceful. We are on our way there, we have to be. When we are there, our nation will flourish. As a nation we are not there yet, as Lee Kuan Yew reminded us recently. A nation accepting and tolerant, which integrates seamlessly, is one impervious to disintegration within. In South East Asia, we have seen too many countries ripped apart by internal conflicts. The ethnic Karens are in constant battle with the Burmese in Burma; in Thailand, the Muslim south never sees eye to eye with the Buddhist Thais. Singapore too had once been susceptible to riots. The government has since constantly reminded us of our fragility and of going against the laws they have set in place to govern this peace. But we are not there yet. Our peace sometimes feels like it could shatter anytime. What is the basis of our peace? The shadowy presence of the Internal Security Act (ISA) is not forgotten by Singaporeans. Memories of Operation Cold Store and Operation Spectrum remind us of a government which will not hesitate to throw dissenters into jail – without trial. Then, there is also the Maintenance of Religious Harmony Act (MRHA). Implicit in the MRHA is the understanding that it is the role of the state to police ‘religion’ so as to maintain “religious harmony”. While the application of this law has not been as brutal compared to the ISA, the law in itself prevents any honest and open discussions of religions. Our laws should not be used to forcefully bring about peace. Instead, they should foster the blossoming of each culture and religion. But have they done so? In 2002, when four 6–year-old girls wore the tudung to school, the government stuck by its principle that schools represent a precious common space, where all young Singaporeans wear school uniform, as a daily reminder of the need to stand together as citizens, regardless of race, religion and social status. As the parents of the children persisted in their belief that faith is as important as education, the girls continued to wear their headscarves. The authorities had to ask them to leave. So instead of students learning about the importance of headscarves to the Muslims, they instead learn that wearing the ‘tudung is wrong’. Ironically, the Sikh boys are allowed to wear turban to schools. Besides the laws, the government all too often preaches that our highly acclaimed economic progress could be destroyed by inter-racial conflict. This is something deeply embedded in our minds. It is definitely true, but the question is: Is our peace so fragile that we have to view race and religion as OB markers? Academics, social and religious activists all tread carefully when broaching the topic. I see a ‘nation’ of peace built on sand. Religious activists alike have a pertinent role to play in our secular society. Stoking unsound religious fervour should be avoided at all costs and to point fingers and blame the different religions/ races for anything is repulsive. The basis for inter-religious peace is understanding. When the Aware saga unfolded, the government took a hands-off approach but it made its point clear – Singapore remains a secular society. Mr Wong Kan Seng, Minister for Home Affairs, said, “Keeping religion and politics separate is a key rule of political engagement.” (ST: 15 May 2009) I believe, this is a way forward until the edifice of our peace has anchored. Does this not show the that ideology of multiracialism (and meritocracy, by the way) which we hold dear to be nothing but a façade – even after 44 years of “nation building”? Open and honest discussions of contradictory topics of religion and culture are often shunned. I would agree that these topics are undeniably and potentially volatile and are possible causes for conflict. This however, should never be the reason to avoid talking about them. There have been inter-religious dialogues in Singapore and a recent participant of such a dialogue mentioned the need for ‘constructive disharmony’. Despite all religions propounding the same moral rules, what we must achieve is to first understand the differences and second, to accept fellow Singaporeans in spite of their beliefs. That is why racial and religious harmony is not just built upon tough laws and strict OB markers, but also on the active desire to engage people of other races and faiths.